Some of the questions we get most frequently at RedMonk concern programming language usage; which languages are being used, how much, and what are the respective growth/decline trajectories? Because there is no single canonical source for this data – even representative surveys are problematic – we examine as many distinct sources as we can to form a larger picture. One of these comes from our client Black Duck, whose already significant Knowledge Base was substantially expanded by its October acquisition of Ohloh. Black Duck’s primary mission in life is digesting information about open source code, from license to language, to streamline the consumption process for enterprises. As it turns out, this data can also be used to understand developer trends. 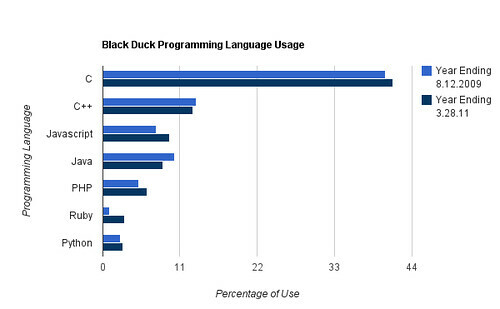 The folks from Black Duck have been kind enough to share some of the language usage data from their knowledge base, which we hope to do regularly, and which I in turn will relay to you here. Before I proceed, two things to note. First, the data supplied by Black Duck included the Top 13 languages usage, but I’ve filtered that down to the seven you see here. Among those filtered was what Black Duck defines as “shell,” which was one spot higher than Ruby; it was omitted because part of that volume is likely configuration and installation shell scripts, which are not what I’m interested in here. The other languages were omitted – as with C# – because their overall usage was insignificant (1.2% all time) and growth or decline were neglible. Second, the dates selected were arbitrary for this instance, because this was an ad hoc query run at our request. Consider timing as necessary when evaluating this data. 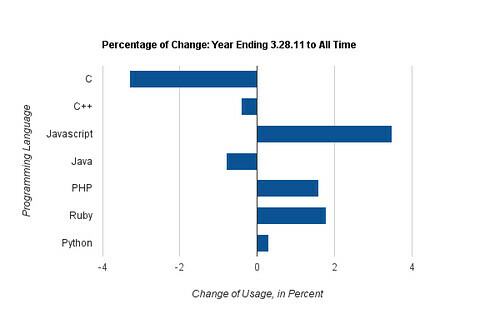 First up is all time usage data. 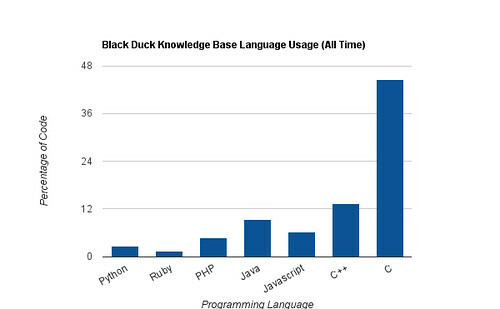 This represents the percent of programming language usage within the Black Duck Knowledge Base. 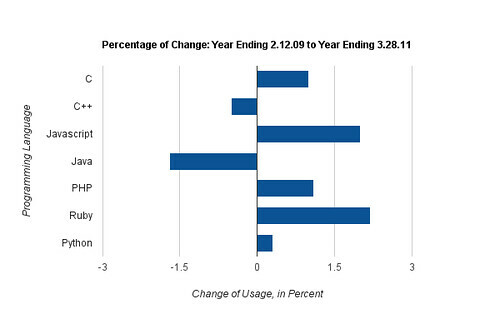 Next, let’s examine the usage pattern for the twelve months prior to 8.12.2009 and the year ending last Monday, 3.28.2011. When we compare March’s figures to the all time volume, meanwhile, the pattern is even more pronounced: dynamic languages have universally gained share, while C, C++ and Java all have declined. Credit: Our thanks again to Black Duck for sharing this data. @Mike Greenly: that is difficult to account for, and I know the GitHub guys have tried to workaround with regular expression exclusions. I can’t speak for Black Duck here, but I suspect they’ll have some intelligence in terms of evaluating projects versus libraries. Interesting data. The growth in Ruby is astonishing. I bet shell-based buildsystem files could be excluded easily enough, there's only a handful of common filenames. I don't really understand what the dates mean in this context. Is this all code in existence on a certain date, or new code committed on a certain date, or projects that released tarballs on a certain data, or what? Do you have the graph with the absolute numbers side-by-side for all time vs present? I'd love to watch a movie of cumulative growth per year to see whether the changes are consistent or whether they bounce around year to year. Since you mentioned statistical validity — from a statistical point of view, taking multiple random samples of their total database and looking at the distributions across those samples would provide more robust results. Several people have been saying so for a few yars. I'm very curious about how the data was measured. Lines of code? Adjusted for language verbosity perhaps? Number of components? Did Black Duck provide any commentary on how the measurements were determined? A big old project will grow slowly in LOC but may have many more comiters. This is simply because it is more time consumming to track a bug or add a feature for a software with 10 millions line of code than one with 10 thousand line of code. I see a real life example from my own experience. At my previous job, working for a new small project (100K LOC), a developper would produce on average something like 50 LOC of JAVA code per working day. Now I’am working in a big software with more than one dozen million LOC. The average is of 7 LOC/dev/day. More interresting, new developpements it more like 2 LOC/dev/day. Another problem, git is about open source and has been made as the source control software for the linux kernel (written in C). It is then logical that you see lot of C inside git repos. Pythons users for example tends to use more mercurial than git. This would lower python stats. But there is even more. Github is about open source. We don’t speak about ALL softwares. 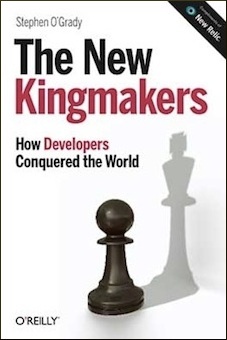 If only a few of us make open source software, most developper have a work for a living. And most of the time it is for closed source software. I really doubtfull that the average OSS guy will like/use the same language than the average software developper. Only a few OSS software are really used. Most are just experiment from one guy were there is no constraint of the language. With github there is even many that create a project, just to illustrate a blog post or something. What all of this mean? Added with other comments, I really doubt the gathered statistics has any interresting meaning other than pythons guys are more on mercurial and JAVA source code is often on closed source so not really visible here.